Owning a home in McKinney, Texas is a point of pride, and outfitting that home with high-quality outdoor lighting will make it all the more enjoyable. 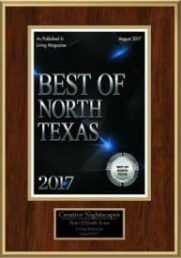 At Creative Nightscapes, we’re proud to offer the highest quality outdoor lighting available in the McKinney area. 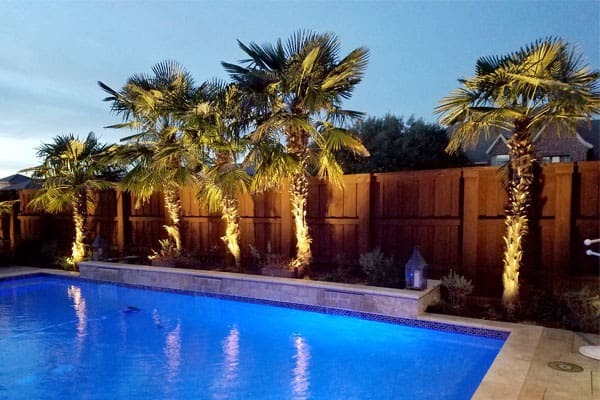 Whether you are looking for landscape lighting, pool lighting, security lighting, or more, you can trust Creative Nightscapes to provide you with beautiful, high-quality lighting that will increase the value of your property and add a new dimension of aesthetic appeal. Designing and installing landscape lighting for your McKinney home all starts with a free quote. From there, our professional designers will work with you to develop a lighting design that goes above and beyond your expectations. Once you are fully satisfied with the design, our installation experts will bring that design to life, working quickly and with minimal intrusion. At the end of the process, you’ll have a custom-designed landscape lighting that will truly brighten up your night. Creative Nightscapes offers environmentally friendly outdoor LED landscape lighting for a Greener tomorrow. This type of low voltage outdoor lighting provides a safe and reliable energy solution for illuminating homes and landscaping all night for pennies a day. You don’t want to have big electric bills, though, and there are ways to get the lighting you love without a lot of expense. Landscape LED low voltage lighting is a great way to make your yard stand out in McKinney. One of the best ways to do that is through the use of low voltage lighting, which doesn’t use a lot of electricity but easily lights up even the largest yards when placed correctly. Having low voltage LED lighting, or other types of outdoor lighting options in your yard can make it beautiful. Contact us, and we can help you explore some great options for an outdoor space you’ll love, day or night. The overall cost of living is 17% higher than the national average. The median household income is $82,298. The median price for homes that are currently for sale in McKinney is $359,000. There’s a lot to love about living in Mckinney, Texas. For one, the city is known for its vibrant culture and community, and the residents are never short of anything to do. Downtown McKinney is charming, lively, and historical, and it also offers plenty of access to amenities, shopping centers, restaurants, and beautiful scenery. McKinney is a city that is bustling with activity, providing you with plenty of opportunities to get involved. One great way to keep up with what’s going on in McKinney is to check out the city’s official website. There you’ll be able to see what events are upcoming in the city and make plans to attend. People in McKinney are very accepting and inviting, and making new friends shouldn’t be hard. Attend a few events, spend a little time downtown, and interact with everyone you can. In no time at all, you’ll be a part of the thriving community. The proximity of a location to Dallas and Fort Worth is an important consideration for many people. McKinney is 33 miles away from Dallas and 57 miles away from Fort Worth. This equates to about a 56-minute drive to Dallas and a 1 hour and 14-minute drive to Fort Worth. If you’d like to check out the city before you decide to purchase a home there, you’re in luck. The city offers plenty of attractions to visitors, making for a fun getaway no matter where your interests lie. Outlined below are some of the landmarks and attractions that you can check out on your visit to McKinney. Historic Downtown McKinney tops the list of landmarks to check out in the city. From stunning architecture to beautiful statues and other works of art, it’s easy to spend an entire day checking out all that Downtown McKinney has to offer. From there, you may want to check out the Heard-Craig center for the arts. This art and flower exhibit is a stunning attraction and an iconic landmark of McKinney. Lastly, stop by the Pecan Grove Memorial Cemetery to pay respect to veterans from all wars since the civil war. There’s certainly no shortage of things for people visiting McKinney to do. For a wonderful tour and delicious drink, you can take a trip to the Tupps Brewery or the Landon Winery. If you would like to get in touch with nature, stop by the Heard Natural Science Museum & Wildlife Sanctuary, or let your dog get in on the fun by taking them to the dog park at Bonnie Wenk. If you decide to call McKinney home, there are plenty of great local businesses that will be happy to help you make the most of your new location. If you need landscaping services, give Luke’s Landscape and Maintenance a call. For plumbing work, you can count on Benjamin Franklin Plumbing. In short, no matter what you need you can count on plenty of great McKinney businesses to rise to challenge. George and his crew did an amazing job! They were such a pleasure to work with. We are so happy with their work! CreativeNightScapes, did what they said they would do it, when they said they would do. They did quality work, and was customer focused. This is a rarity in services today. I am most pleased with all aspects, did not select them for price and glad I did not. I highly reccommend them. This was one of my best home service experiences yet. The whole process was quick and seamless. We love our new lights! We are extremely pleased with the way our lighting design turned out. Our new home looks beautiful at night! The pricing was inline with other bids, and the service was great. The installation was problem free, and the end product looks great. Stellar design ideas, terrific installation execution. George had great ideas on how to best work within the parameters of our home for lighting options. Stephen and the installation team did an incredible job executing that vision. The final result is amazing and we couldn't be happier with the outcome. Installed Kichler LED outdoor lighting at home in Village Park. Placed up lights to accent facade of home, columns right of entry, and 2 small trees. Mounted down lights under eaves to highlight yard below in back yard. 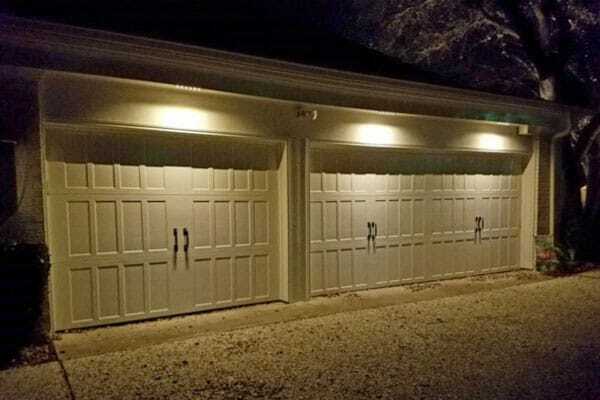 Mounted hardscape lights to illuminate garage door and second level facades and columns. Installed Kichler LED outdoor lighting at home in Village Park. Placed up lights in front of home to accent facade and small tree. Mounted down lights and hardscapes in eaves to highlight patio entrances and yard areas. Removed existing fixtures. Installed Kichler LED outdoor landscape lighting at home in Fairway Vista at Eldorado. Placed up lights to accent facade of home and trees behind pool. Mounted down lights in eaves to illuminate side yard, driveway, walkway, and trash can area. Set wash lights to accent landscape greenery in back yard. Installed Kichler LED lighting at home in Crimson Ridge. Placed up lights to accent front entry, facade, Japanese Maple, and other trees. Mounted down lights to highlight driveway, pool deck, and walkways. Set path lights to illuminate walkway, steps, and landscape greenery. Mounted hardscape lights to illuminate walkway and steps near street. Installed Kichler LED landscape lighting at home in Waterbury. Placed up lights and mounted down lights to accent various trees throughout the property. Installed Kichler LED lighting at home in Lacima Haven. Placed up lights to accent facade of home, peaks, columns, and trees. Mounted down lights in eaves to illuminate yard between house and fence. Set wash lights in landscape beds to highlight yard art, planters, and landscape greenery. Installed Kichler LED outdoor landscape lighting at home in Cascades sub-division. Placed up lights in front and back yards to accent facade of home, columns of Grand Entry, Oak trees, Crepe Myrtles, Palm tree, and Red Bud tree. Mounted down lights under eaves highlighting pool deck, lounge area near pool, seating area, and rock formation on the back side of pool. Set path lights to highlight walkway leading to front entry. Installed Kichler LED landscape lighting at home in Altamura Estates. Placed up lights across the front of the hosue to accent the facade and front entry way. Mounted down lights in a tree to create moonlighting effect and illuminate landscape greenery and walkway to front door. Installed Kichler LED landscape lighting around the perimeter of Throckmorton Park in Craig Ranch. Installed Kichler outdoor lighting at home in Village Park. Used up lights and hardscapes in the front to accent address sign, facade of home, columns, double garage doors, second level of home, and Oak tree.